While we haven’t known Dana Piccoli for very long we were excited when she came to us with merchandise needs. Dana is well known in the LGBTQ+ community as a writer, critic, podcaster and panel moderator. 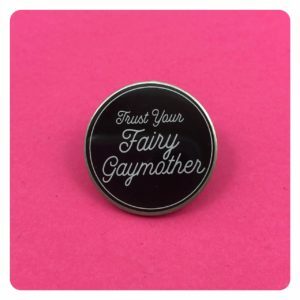 We were already running ideas around in our heads when we got the message from Dana saying that she wanted to have items related to her new persona as every Queer’s “Fairy Gaymother” at conventions and events. We have the first of these items up for sale in the shop and are continuing Dana’s philanthropic donations to TRUE COLORS FUND by donating ten percent of each items proceeds to the cause. The True Colors Fund is working to end homelessness among lesbian, gay, bisexual, and transgender youth, creating a world where all young people can be their true selves. 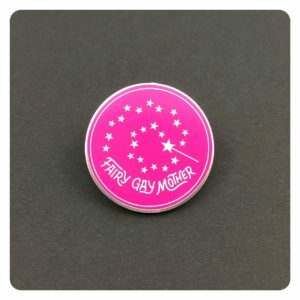 Click the images to view and purchase the pins!